Personalized graphic design services on request. 24 hour business card turnaround in flat ink designs with many paper weight and color stocks available. 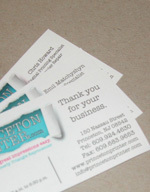 Our friendly staff will help you customize the perfect business card in-house and exactly how you expect. No online ordering needed, just come in and receive most orders the next day.